Jon Ferrara, a 2008 member of the Raiders tuba section, submitted this photo and caption. 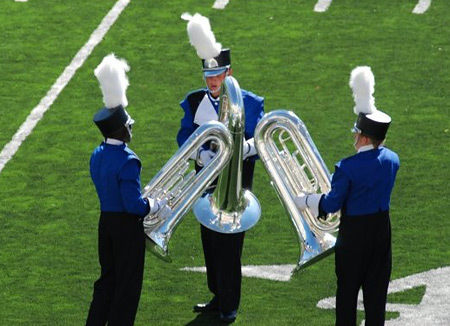 This is a photo of the Raiders' 2008 tuba line at the Open Class World Championship Finals. The 2008 season was the most amazing ever and having these other two guys with me at all times was incredible. I miss these guys and wish them the best of luck in 2009. Clockwise from the top: Me (member 2007-2008), Raymond (member 2008), Daniel (member 2006-2008).